Am I reading the dev notes right? You can now rollback from iOS 8 to iOS7? Discussion in 'iOS Programming' started by chrono1081, Jun 3, 2014. Am I reading the dev notes right? You can install iOS 8, then roll back to 7 without any crazy hacks?? Just simply backing up to iTunes? 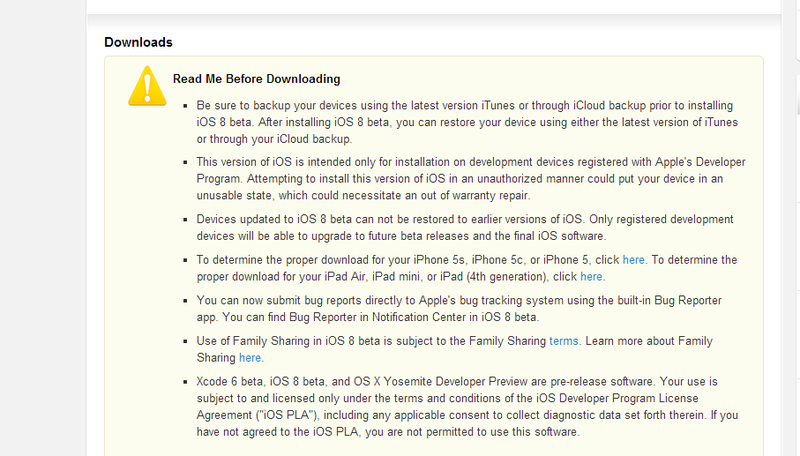 Devices updated to iOS 8 beta can not be restored to earlier versions of iOS. Only registered development devices will be able to upgrade to future beta releases and the final iOS software. Yes, that contains the text that informs you that you cannot restore to earlier version of iOS. Ah ok I see what it's saying now. It's saying just restore your device in general. I thought it was weird that Apple would suddenly enable you to roll back operating systems. Typically you can rollback during beta by doing a DFU restore, although this isn't supported by Apple. Yup, it was ALWAYS possible, with every single beta. But it's really the only way, so make sure you've got backups and time. If it works using DFU that would be great. I have an app at work I want to test but I'd rather not test on the work iPads and would Rather test on my own. Not if they also update the baseband code to a version which is incompatible with any earlier OS release. Then you could end up with non-functional cellular or worse after an unsupported DFU install.